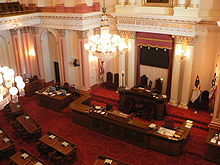 The California State Senate is the upper house of the California State Legislature. It has 40 members. 28 of them are from the Democratic Party, 10 of them are from the Republican Party, and two seats are empty. It meets at the California State Capitol in Sacramento. This page was last changed on 26 January 2019, at 17:45.